Ever since moving here I’ve been on a quest to find the best view of Joburg. Not only because I want to see the nice view, but because I’ve really been kinda wanting a cool header for my blog. Johannesburg has a beautiful skyline, but the trouble is, most places from where you can possibly take a good picture are a bit dodgy, to say the least. Not locales you want to hang out at, much less lug your expensive camera equipment around, especially at sunset, even though a sunset shot is what I really really want. I won’t claim I found THE best view, but I did strike gold the other day for some unsurpassed 360 views. Noisette and I had been adrift on our way from Soweto and a rather boring music performance some time back, if you’ll remember, and in an effort to salvage the day I was Googling while he was driving. 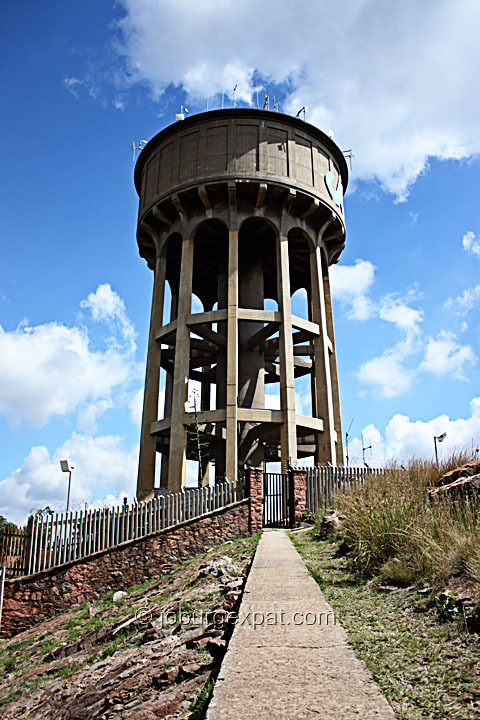 One of the Joburg landmarks I’d come across at the time was Northcliff Hill, but we ended up going to the Westcliff Hotel that day instead, because we happened to drive right by it. 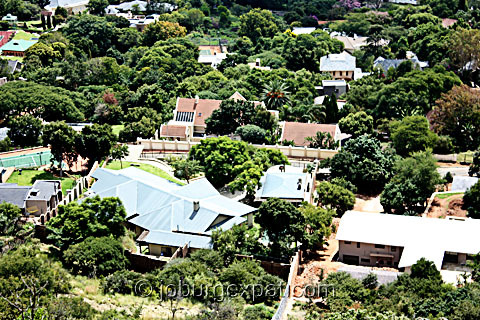 Westcliff, Northcliff, what does it matter, right? But when I was driving home by myself from an Alexandra Baseball game just a few days later and happened to pass a sign for Northcliff, I gave in to temptation and decided to go check it out. 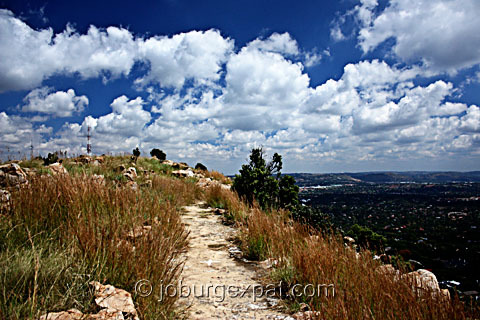 It took a little bit of guesswork and a few U-turns, because I didn’t have an actual address, but eventually I made my way to the top of Northcliff Hill. The views were absolutely stunning. As promised, 360 degrees of beautiful vista, all within a ten minute hike around the top of the ridge. And the cool thing is, I had it all to myself. 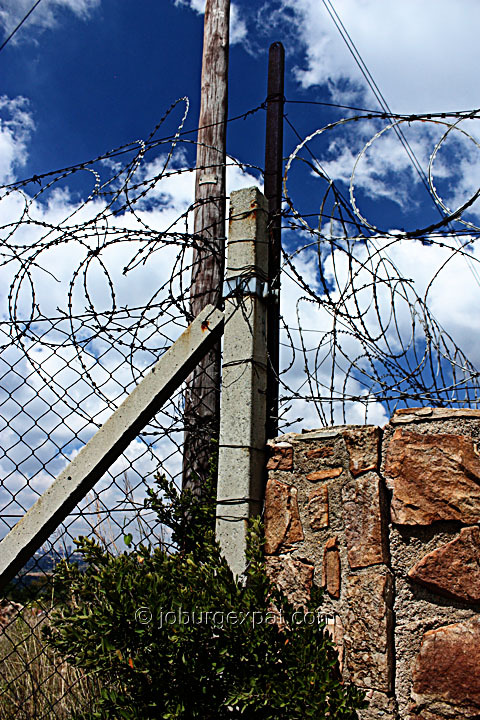 Which was just as well, because I had to clamber up some walls and fences to get a better shot at the Jozi skyline, and was glad no one was there to observe me make a fool of myself. Having gotten that close, I wasn’t going to go home without a nice panorama shot! 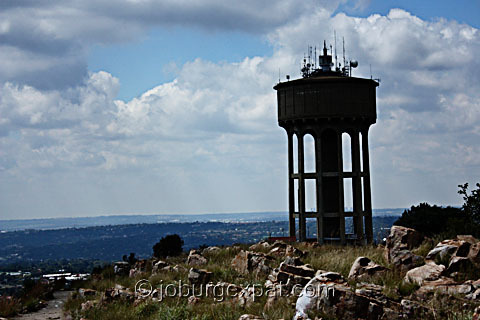 At 1807 meters, Northcliff Hill is actually the second highest point in Johannesburg. Highest point honors go to Observatory Ridge, but really only by one meter, if Wikipedia is to be trusted. I’ll have to go check that one out as well. I’ve already seen the view from the balloon at Montecasino, which isn’t bad but too far away from the Joburg skyline to make it interesting. And I’ve seen the view from a real hot air balloon going over the Magaliesberg towards the North of Joburg, which was spectacular. Then of course there is also the Carlton Centre (in its day the highest building in the Southern hemisphere, now still the highest building in Africa) for some great views, still on my list. Since I haven’t seen it all yet, I won’t claim Northcliff Hill is the absolute best view in Joburg, but it has been the best view by far for me up until this point. See for yourself below by clicking on the image to enlarge.